6 Flags over Texas? Fourth class headrights? Huh? 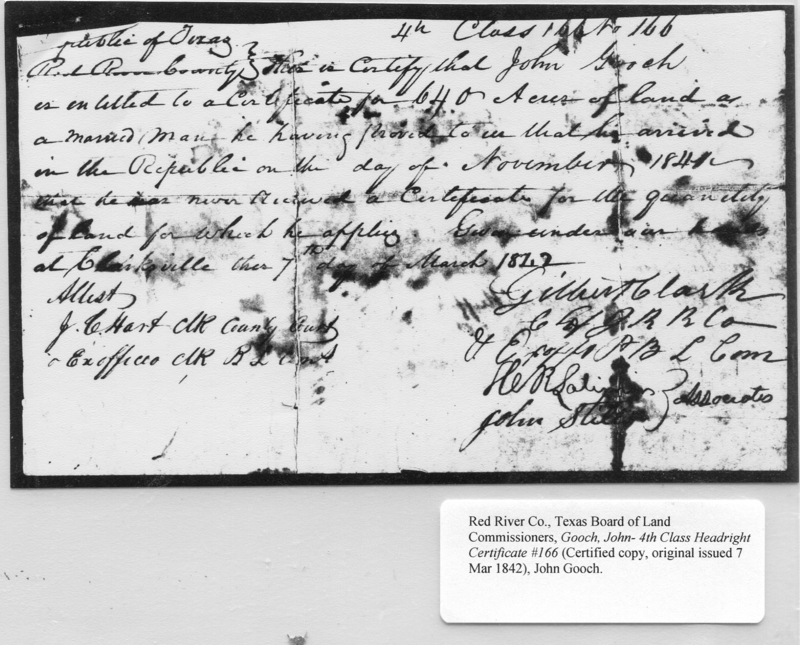 Posted on February 27, 2015 by Dayna Jacobs - "On Granny's Trail"
John Gooch received a 4th Class Headright Certificate #166 from the Republic of Texas and was granted 640 acres of land – that’s one square mile – by virtue of the early Texas Land Grant provisions. “Headrights”, or land entitlements, were granted according to the date of arrival in Texas and other requirements such as marital status and minimum years of residency. 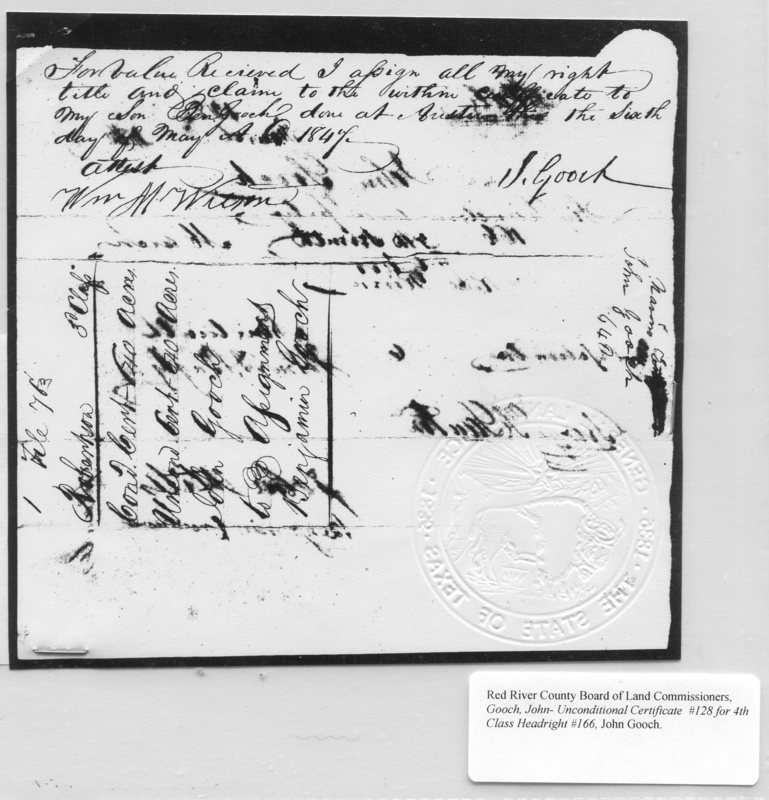 Red River Co., Texas Board of Land Commissioners, Gooch, John- 4th Class Headright Certificate #166 (Certified copy, original issued 7 Mar 1842), John Gooch. 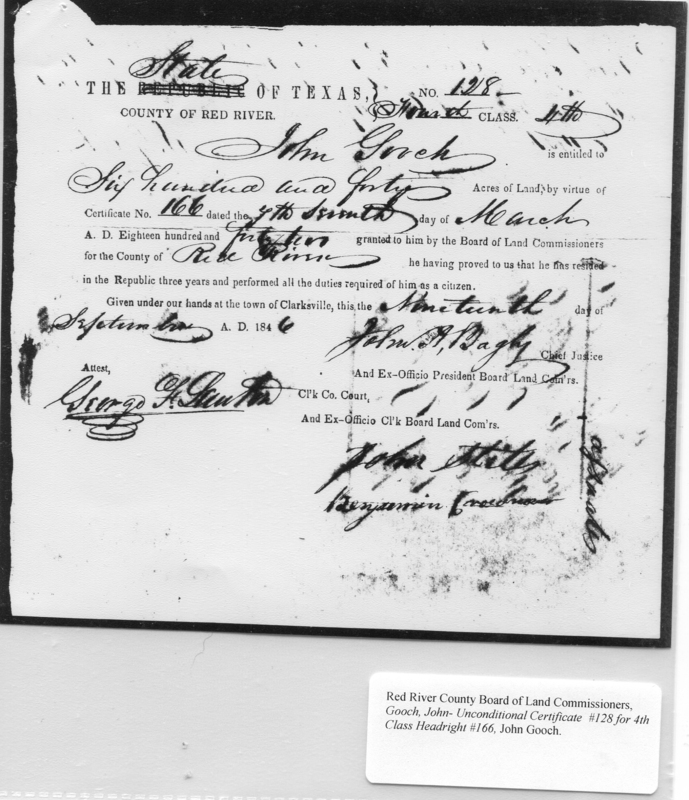 Here is his land grant certificate #128, and notice “Republic” of Texas has been crossed out, with “State” written in above. The date is 19 Sep 1846, and The United States had annexed the Republic of Texas on 16 Jun of 1845, causing a little problem with Mexico. Texas had declared itself a Republic in 1836 – Remember the Texas Revolution? 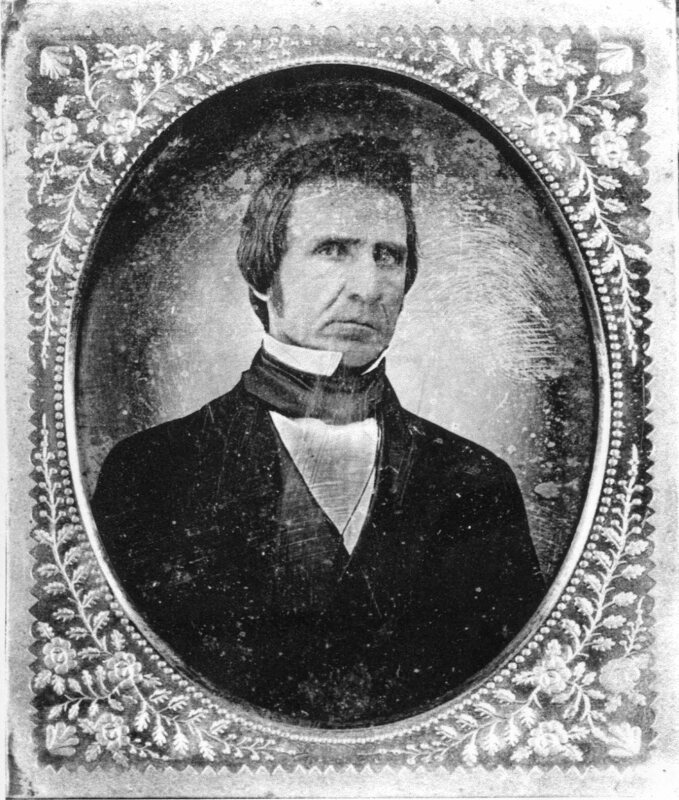 – but Mexico did not recognize Texas independence, and the U.S. annexation of “their” territory was not appreciated. The U.S. declared war with Mexico in May of 1846. 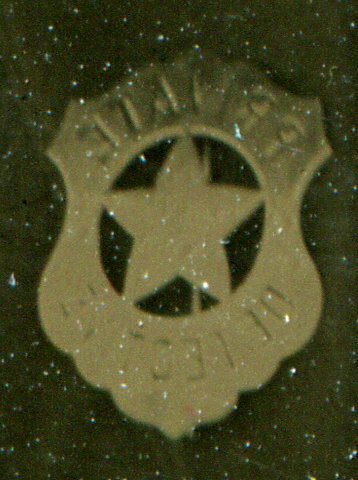 After 1845 the Texas Land Office saved on printing costs, crossing out “Republic” to write in “State”. Besides, depending on the outcome of the war they could be back to “Territory” before long. Red River County Board of Land Commissioners, Gooch, John- Unconditional Certificate #128 for 4th Class Headright #166, John Gooch. Notice on the back of this certificate John has transferred his rights to his son, Benjamin, with “Robertson” [County] also noted. I don’t know why it says 3rd class on it. 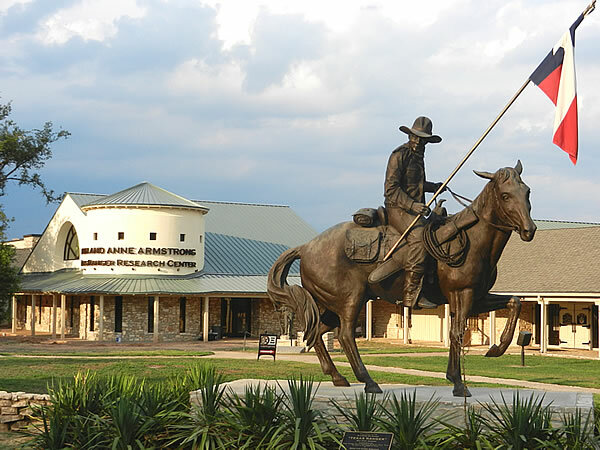 The Texas General Land office has an online index and images of early land grants issued by one of the governments of Texas: Spain, Mexico, the Republic of Texas, and the State of Texas. That’s four flags, if you were counting. The other two flags over what is now Texas were France and the Confederate States of America, but they did not grant land. 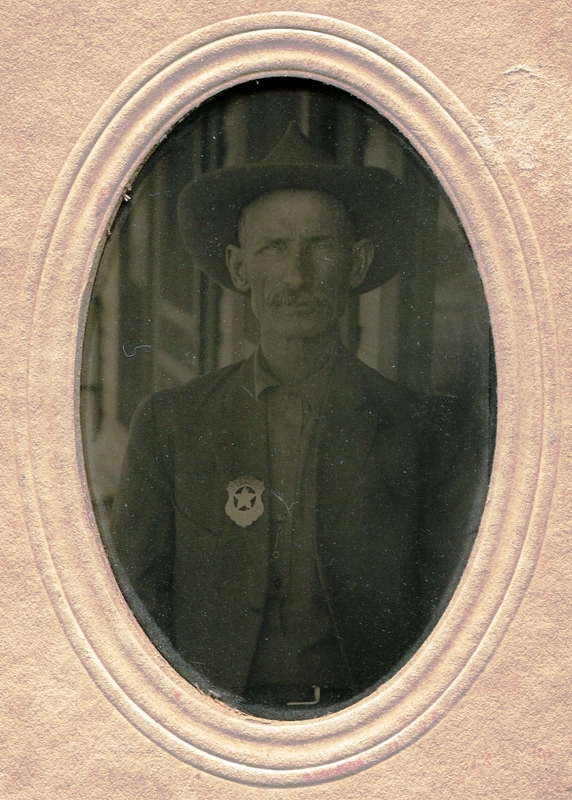 To receive a 4th Class Headright Certificate a man had to have arrived in Texas between 1 Jan 1840 and 1 Jan 1842. A married man was entitled to 640 acres, and a single man to 320 acres. Ten acres had to be cultivated. This is another excellent example of the value of land records in your family history research, and the importance of putting your research in the context of historical events. Posted on October 24, 2013 November 14, 2013 by Dayna Jacobs - "On Granny's Trail"
My specific goal for this trip was to locate my ancestors’ original land tracts on a modern map, so I could drive there and take pictures of the surroundings. Posted on October 10, 2013 November 14, 2013 by Dayna Jacobs - "On Granny's Trail"